This is an odd way of packaging just not sure if it is good for the environment or just the opposite. 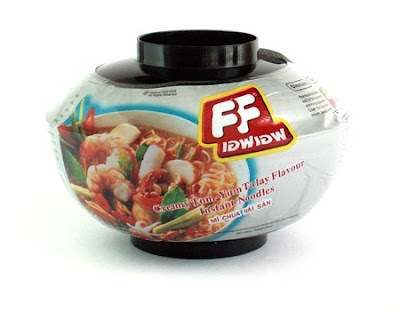 This noodle packaging have a plastic and microwave proof bowl as packaging around the noodles inside, so you can either pour boiling hot water in or just pour water in it and put it in your microwave. 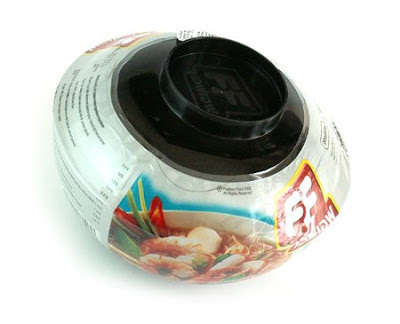 However the packaging can easily be cleaned an reused for eating and reheating other meals. And the price of this whole packages is fairly low, it was about , so if you want to get yourself some cheap bowl you could eat some noodles for several days. However I am afraid because if you eat this allot you would end up with allot of these bowls and be thrown away instead of being reused. And cause it is plastic it isn't that great for the environment if people would throw these away. Is good to have this as a temporary special edition but not as a standard. The taste isn't bad but was bit too hot for my taste. But overall isn't bad if you don't put in the whole spice powder bag in to it but halve. For the rest of the design isn't that bad compared to most of the Asian packaging designs. Actually looks bit professional, just the shrink rap doesn't look that 100 clean fitted bit isn't much a problem. Only the text under the logo and overlapping the picture looks out of line with rest of the design and typeface, but overall color and rest of the design is good. Too bad it didn't have the shrimps and all the stuff in there so might been better to show how it really looks and use the black bowl in the photo instead of a photo of something totally different.